Stream of consciousness refers to the practice of writing down ideas as they come into your head. The conventions of grammar and appropriateness of language is usually ignored when using this literary technique. For those of you who cringe at the misplaced metaphor, or the comma splice, or the occasionally correctly spelled wrong word so frequently seen in this day of spell-check reliability, don’t worry there are a lot more things in here to worry about. Concern yourself with the things that go bump in the night. The unexplained. The unexplainable. A word of caution to the easily offended: some of the word choice used by the voices may not be acceptable in mixed company. When you deal with fears like these it is important to allow the voice freedom. 30 Days Stream of Consciousness: A Haunting is the second book in a three book series (at least, so far) by L.E. Moebius. 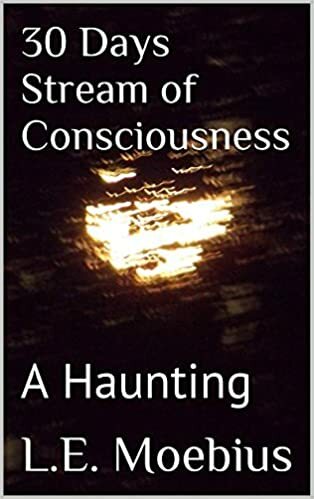 This is a novella length story written in first person stream-of consciousness style to tell the story of paranormal activities in the house the main character currently inhabits. The premise of the story is this is a 'haunted house' that the main character's friend bought at auction. The man can live there for 30 days rent-free if he helps with repairs. He agrees even though he knows that there have been rumors about the place for years. The story starts out fairly normally with just a few odd happenstances, missing keys, objects moved, and so on. The episodes of strange behaviors start to escalate as the days go on. He adopts a kitten that he finds and the cat starts to manifest peculiar habits. And the 30 days continue with odder and odder happenings. There is a lot of things left to the imagination in the story and that helps in a way. I'm not especially fond of this style of writing, but it worked in this setting and made for an interesting read. If you like Twilight Zone type stories, then this one is for you. Here’s the link to Amazon . Lucinda Moebius has been a writer since she was a child and was first published in 2010. Since then she has worked hard to create unique visions and stories. Her work includes novels in multiple genres including: Science Fiction, Fantasy, Paranormal, Children’s Books, Screenplays and Non-fiction. Lucinda has a Doctorate in Education and loves teaching, but her greatest desire is to help others understand how literature and writing can bring enlightenment and understanding to everyone. She offers book coaching and advice to everyone, whether they want it or not. How to identify, pick, and cook Fiddleheads! June Issue Fantasy Worlds emag is out!